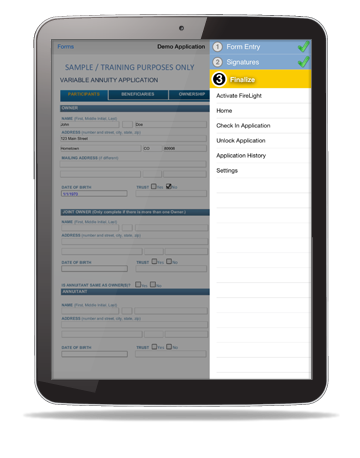 Quickly capture client data and signatures to submit in-good-order electronic applications with FireLight eApp™ mobile app. The FireLight eApp™ provides advisors immediate and secure account access to capture client data on up-to-date carrier applications as well as client signatures, expediting the sales application process. As an advisor, it is key to be able to capture business anytime, anywhere, no matter if you're selling Annuities, Life, Long Term Care or Mutual Funds products. FireLight® e-Application is an electronic application platform that simplifies the application process, providing advisors a step-by-step guided process to gather all required form information to be submitted to the carrier. FireLight eApp can only be accessed by authorized users whose firm or carriers are a licensed FireLight client with Insurance Technologies. To submit applications electronically using the FireLight eApp, obtain an Access PIN from your FireLight web access or speak with your home office to determine if your firm is a licensed FireLight client. For technical support, please contact your firm or carrier. Submit In-good-order business with FireLight®e-Application!